The Ohaus Adventurer Pro Analytical Balance offers powerful flexible performance in a compact footprint. Clean up is a breeze thanks to the easily removable stainless steel platform and removable wind ring. This analytical balance has a 210g weight capacity, and is operational in a range of 10-30°C. Capable of dynamic weighing, piece counting, percentage, totalization, check weight, display hold and weight logs, this compact balance has a lot to offer you lab. 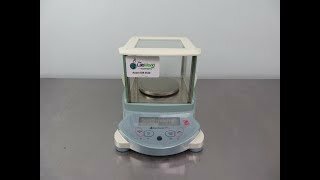 The Ohaus Adventurer Pro Analytical Balance features a wide variety of weighing units, or should you have a unique weighing application, a user defined custom unit can be created. Weights and functions are displayed on a bright, 2 line alphanumeric, LCD screen, while simple navigation using the SmarText software. This software guides users of the laboratory scale through set up and functions, navigating with the four button keypad. The Ohaus Adventurer Pro Balance also features connectivity through a RS232 interface. Because the Ohaus Adventurer Pro Analytical Balance can be placed anywhere, leveling to ensure accuracy is key. This laboratory balance has a front level indicator, allowing users to quickly check that the balance is level between uses. The Ohaus Adventurer Pro uses QuadraStance design, 4 wide set adjustable feet to help prevent rocking or tipping, giving it superior stability. The Pro is ideal for harsh environments outside of the lab, the user can adjust settings to compensate for vibrations. Lastly, should you not want the portable Ohaus Adventurer Pro Analytical Balance moved, it has a built-in security bracket, allowing the user to tether the balance in place. This Ohaus Adventurer Pro Analytical Balance has been tested and calibrated with our own weights and performs as expected. If you have any questions about this or any of our other scales please don't hesitate to contact us.